Since the most recent update, even the least expensive Porsche 911 packs a turbocharged engine, but its legacy as a widow maker continues to give surround the 911 Turbo in an aggressive mystique. This fresh batch of spy shots catches the upcoming power player during some testing around the Nürburgring. 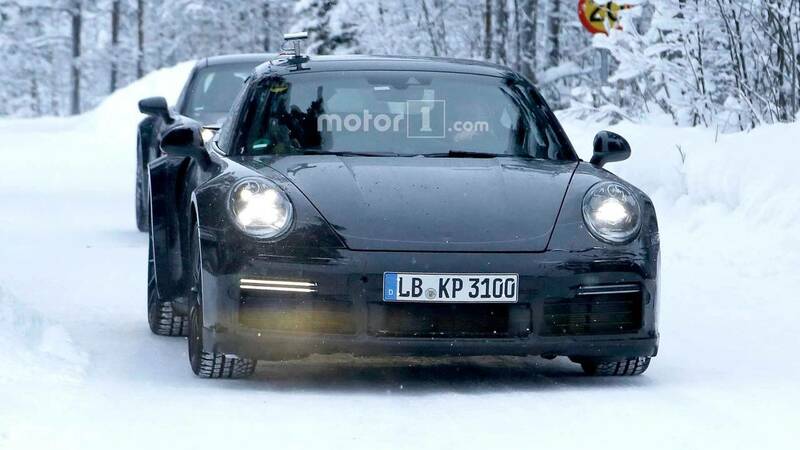 This 911 Turbo looks generally similar to the test mules in previous spy photos (like in the gallery below). The new generation appears to have a significantly wider track than the current one. The company also adds more sculpting to the hood, which creates a more visually interesting front end. Around back, this one shows off the extending wing in its raised position. Porsche continues to have lots of camouflage on the tail, but the quad, squared-off taillights look fantastic. Inside, the 911 retains an analog tachometer, but the rest of the instruments have digital displays. A thoroughly revised center stack features a bigger infotainment screen and quite an array of buttons, according to spy photos of the cabin. The next 911 Turbo will continue to use a biturbo flat six, and the output will reportedly be above 600 horsepower (447 kilowatts). The figure will still likely be less than the current GT2 RS‘ 690 hp (515 kW), though. To give drivers an easier time to harness this power, expect an all-wheel-drive layout. 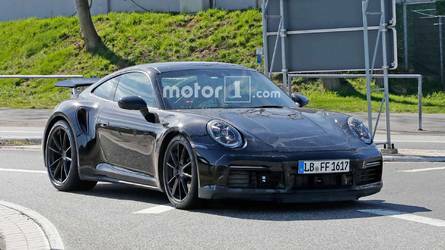 The new 911 reportedly debuts later in 2018, possibly in the fall. Don’t expect Porsche to reveal the Turbo at the same time, though. It could be very late in the year and likely in 2019 before this model makes a premiere. Porsche isn’t quite done with the existing 991-generation of the 911, yet. Recent spy photos reveal that the company has a limited-run Speedster under development. The more stylish droptop should debut this summer, which is just in time to show off the model’s revised look.